The Master of Business Administration for Executives (EMBA) is operated by the Executive and Specialized Programs Office in the College of Business Administration, and is an alternative path for the Master of Business Administration degree. The program is designed to meet the needs of mid-career executives. Students in the program have an average of 15 years of full-time professional work experience and eight years of managerial or equivalent experience. Students accepted for the MBA for Executives are fully matriculated in the university and meet all university requirements as established by the Graduate Council. Courses are scheduled in a modular fashion on alternate Fridays and Saturdays. Students complete an approved program of study containing 48 units offered in a predetermined pattern over 21 consecutive months. No transfer courses and no substitute courses are accepted. For more information on the program, call (619)-594-6010, visit sdsu.edu/emba, or see the current SDSU Graduate Bulletin. Please note: students must be fully admitted to the University by the Executive and Specialized Program Office to be eligible for registration in these courses. 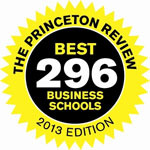 The Princeton Review recently ranked SDSU's graduate business program as one of the best internationally. Role of the manager in designing organizations for effectiveness with emphasis on organizational theory and organizational behavior. Statistics and production operations management. Data analysis, central tendency and variability, probability, distributions, sample inference, association analysis. Applications in engineering, manufacturing and service, and an overview of decision theory, queuing, total quality control, and project management. Accounting procedures and judgments underlying corporate financial statements; ability to read and analyze these statements; make inferences about financial stability, likelihood of success, and other important attributes of various business entities. Accounting information for internal decision making purposes to include cost measurement, capacity management, activity based costing, activity based management, production costing, quality costing, pricing, CVP analysis, budgeting, performance evaluation, transfer pricing, and compensation. The marketing function in an organization. Managerial activities of marketing including market analysis, target market selection and design of the organization’s marketing program. Provides a framework for financial decision making. Covers relevant modern theory and emphasizes role of finance in corporate strategy. Topics include financial analysis and planning, investment, capital structure and dividend decisions, and valuation and corporate restructuring. Not open to students with credit in Business Administration 653 or Finance 615. Competition in typical unregulated product or service markets. Competitive forces in such markets, and impact of these forces on economic profits, rates of return, and relative market-shares of competing firms. Not open to students with credit in Business Administration 665 or Finance 616. Evolution of multinational corporations, management of organizations in global environment, and marketing and management implications of competition in international arena. Entrepreneurial approach to business. Concepts, theories, and techniques for organizing and managing an entrepreneurial venture. Role of the manager in dealing in a socially responsible and ethical manner with internal and external constituencies. Corporate and business level strategic decision making. Topics include industry and environmental analysis, strategy implementation, and strategic planning systems. Case descriptions of actual company situations serve as basis for analysis and recommendations. Development, implementation, and evaluation of marketing strategy and plans. Role of marketing planning, analysis and control; contributions and implications of marketing to corporate strategy. Strategies for attaining competitive advantage. Contemporary marketing planning tools and techniques. Negotiations principles in managerial contexts. Concepts, skills, and simulations of negotiation processes. Develops understanding of world economy and illustrates impact of financial environment on decision making process of business managers. How corporations respond to changing economic forces and/or historical governmental policies. Theoretical and empirical literature pertaining to study and assessment of leadership skills. Process of organizational change and development. Challenges facing managers of organizations in modern society: organizational, human resources, operational, economic, environmental, political, international, and technological issues. See Class Schedule for specific content. Maximum credit five units applicable to a master's degree. Challenges facing managers of organizations in modern society: organizational, human resources, operational, economic, environmental, political, international, and technological issues. Preparation for the comprehensive examination for students in the MBA for Executives program (Plan B).